POW! WOW! DC 2019 is Gearing Up! As 2019 kicks off, the POW! WOW! DC crew is hitting the ground running preparing for this year’s festival. With some new plans in the works to make this one our biggest and best to-date (like every year, obviously), we are looking to round out our sponsor roster and start putting together our teams of volunteers! If you love what we do and want to be a part, please reach out ASAP! We are open to all kinds of partnerships and collaborations and we want to know what you’ve got! We are looking for Volunteers, Sponsors, Partners AND of course, Artists! Happy New Year from the POW! WOW! DC family and we can’t wait to see you this summer! POW! WOW! brings artists together from the far corners of the country and throughout the world to create larger than life works of art. Murals from artists, who may only visit Washington, DC this one time, live on long after they've left. Our goal is to make the city a brighter and more vibrant place, while sharing art and creativity from around the world. Each year we strive to bring more and more artists together to paint our city. Each year we try to involve more and more aspects of the community with our festival. Our goal is to share what we do with as many people in the city as we can. We provide a number of guided tours of the mural sites during and after the festival, giving attendees a chance to see each artists' process. Our family friendly opening event gives the youth a chance to get involved. 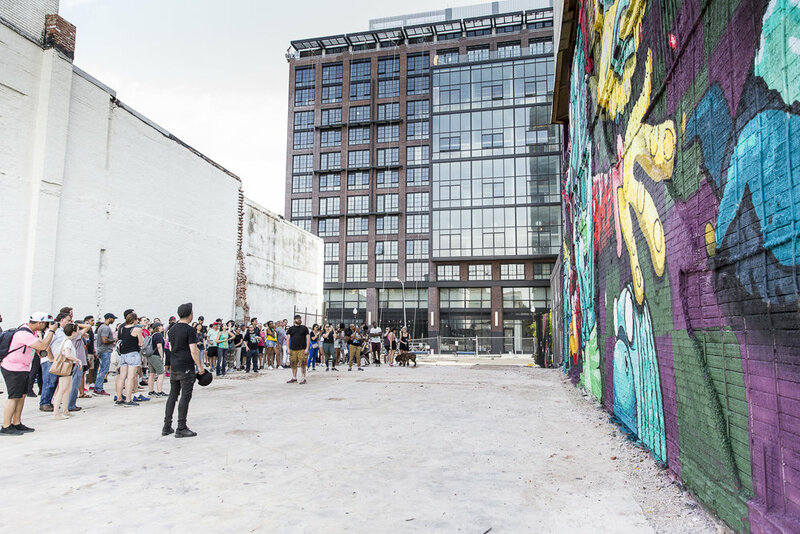 Families and groups of friends can come and be inspired, eat, drink and dance and then venture out into the neighborhood to tour the mural sites as artists work. We hope to inspire the next crop of creators in Washington, DC. POW! WOW! Washington, DC is a non-profit festival that is put together each year by local artists. Funds are raised through a number of ways, from city grants and sponsors, but a festival is expensive! We are always looking for new partnership opportunities to develop ways for us to make next year's POW! WOW! even better than the last. If you think you might like to be involved with POW! WOW! DC, click the link below. HOW DO I COME TO POW! WOW!? Is it your first time coming to POW! WOW! ? Did you come out last year and had no idea what to do? You're in luck, click the link below for everything you need to know about how to get the most out of POW! WOW! DC. Subscribe to our email list to get updates on events, mural sites and more!